I have always wondered: why is the sea salty? Salt flows down rivers to the ocean. The short answer is that water dissolves the salts contained in rocks, and these salts are carried in the water to the sea. As raindrops form, they absorb carbon dioxide from the air. The water (H₂O) and carbon dioxide (CO₂) react to form carbonic acid (H₂CO₃). The carbonic acid makes rainwater slightly acidic, with a pH of around 5.6. Pure water has a pH of 7, which is neutral. So, rain dissolves salts out of the rocks and these salts are carried via runoff to streams and rivers and finally to the sea. Rivers carry almost 4 billion tonnes of salt to the sea each year. But rivers aren’t salty, right? 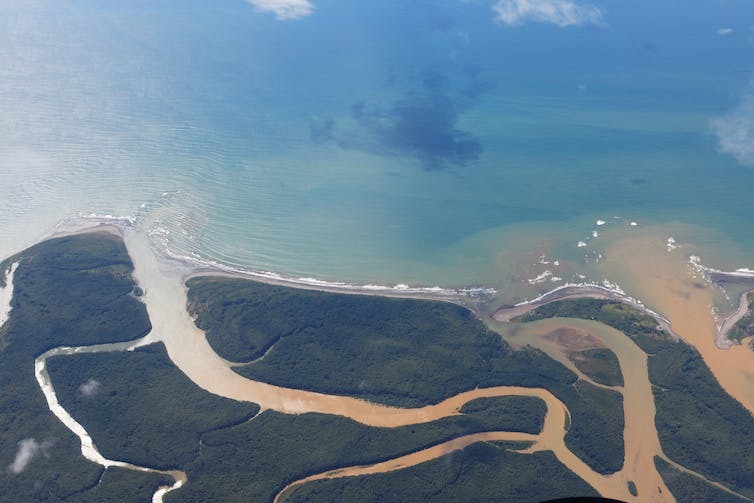 Rivers are definitely not as salty as the sea, but they constantly carry their small salt content into the sea, and as a result the concentration of salt in the sea (which oceanographers call salinity) has built up over millions of years. In fact, rivers aren’t the only source of sea salt. 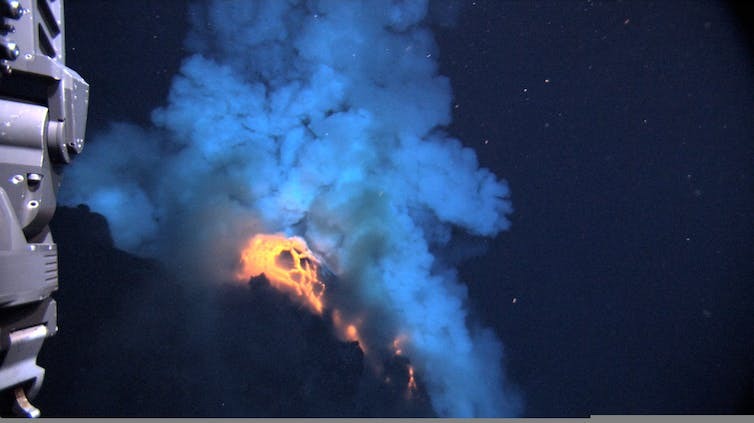 Rocks in the sea also play a role, and hydrothermal vents in the ocean floor and subsea volcanoes also supply dissolved salts to the sea. Super-heated molten lava about to explode into the water. Over millions of years, the concentration of salts has increased from possibly almost fresh in the primeval sea to where it is now – an average of 35 grams of salt in every kilogram of seawater. If all this salt could be taken out of the ocean and spread over Earth’s land surface, according to the US National Oceanic and Atmospheric Administration, it would form a layer more than 150 metres thick. Why are some places saltier than others? Salinity varies from place to place in the sea, depending on how close you are to rivers, how much rain falls, how much evaporation occurs, and whether ocean currents are bringing in saltier or fresher water. In general, the sea is saltier in the subtropics, where evaporation is high due to warm air temperatures, steady trade winds, and very low humidity related to atmospheric circulation patterns called Hadley Cells. The sea is fresher close to the Equator where rainfall is high, and in the Southern Ocean and Arctic Ocean, where sea ice melt in the summer adds fresh water. NASA’s ‘Salt of the Earth’ Aquarius map. Enclosed seas, such as the Mediterranean and Red Seas, can be very salty indeed. This is because the removal of fresh water by evaporation is much larger than the addition by rainfall, and lower-salinity waters from the deep sea can’t flow in as easily. While the total amount of salt in the sea is pretty constant, the distribution of the salt is changing. Broadly speaking, the salty parts of the ocean are becoming saltier, and the fresh parts fresher. These salinity changes are caused by changing rainfall and evaporation patterns globally, where wet places are generally becoming wetter and dry places are getting drier. Read More: I have always wondered: when do baby birds begin to breathe? This amplification of the water cycle is a consequence of rising air temperatures due to climate change. Warm air can hold more moisture, so it can receive more evaporated water from the sea or land surface, and then release more when it rains. Just how fast the water cycle is amplifying is a topic of current research. Rainfall and evaporation are difficult to measure accurately, particularly over the ocean where 78% of rain falls. 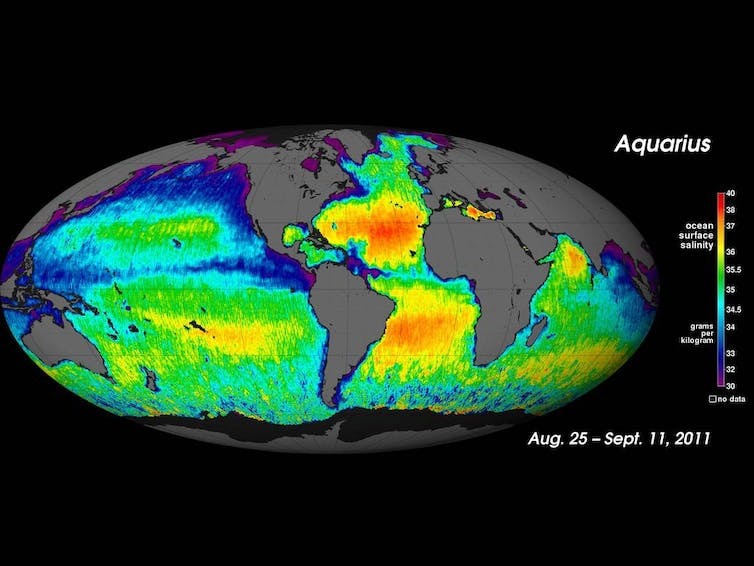 Ocean salinity, on the other hand, is easier to measure now that we have the global Argo program: an armada of profiling floats that measure salinity and temperature from the surface to a depth of 2,000m, and surface salinity measurements via satellite. Ocean salinity measurements are not only being used to understand past changes in the water cycle and reduce uncertainty in climate models, they are helping to improve seasonal rain forecasts around the world.